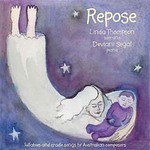 Repose : lullabies and cradle songs by Australian composers 1890-1999 / Linda Thompson: soprano, Deviani Segal: piano. Lullaby, op.52 no.2 : from the Ugly duckling / Eric Gross ; words by Alan Kitson. Instrumentation: Soprano voice, harp (or piano). Difficulty: Easy — AMEB Grade 6. 13 May 76: ABC Studio, Chatswood, Sydney. Featuring Pearl Berridge, june Loney.